In 1869, Rudolph Rasmussen opened a furniture factory. But sadly the workshop burnt down while completing an order for the Hotel d'Angleterre. Rudolph Rasmussen collected the insurance money and spent all DKK 10,000 of it on the down payment for a property at Nørrebrogade 45. Rud. 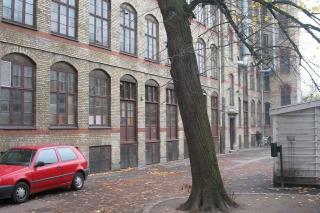 Rasmussens Cabinetmakers was a typical backyard industry founded at the end of the 1800s in inner Copenhagen. The building still functions as a factory today, producing furniture in a vertical process: The timber dries in the basement, the machinery is on the ground floor and first floor, the manual cabinetmakers are on the second and third floors and the upholstery department is on the fourth floor. It is one of the few remaining [old] factories in the area still running at full speed. From its modest beginnings, the furniture factory specialised in exclusive design. Rudolph Rasmussen knew his customers' tastes very well. Some of the earliest furniture produced at the factory can be seen at the National Museum's Victorian style Klunkehjem" by Frederiksholms Canal. This is the final resting place of some of the finer pieces that Rud. Rasmussen had designed by Art Nouveau architects such as Bindesbøll and Dahlerup in around 1890. The cooperation with the leading architects of the time continued into the 20th century when the factory invited classical modernists such as Kaare Klint and Mogens Koch to design furniture. Later, Børge Mogensen and Hans J. Wegner were also added to the payroll. Modern furniture is still a cornerstone of the company's production today. For example, Klint's famous safari chair is still delighting Rud. Rasmussen's customers today. "